Not satisfied with IC 555 design. Now I am going to exploit its Control voltage pin 5. 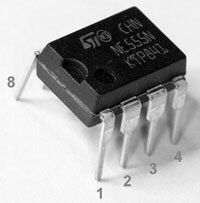 This pin is used to give a controlled voltage to control the working of the Flip-Flop inside the IC. But if it is not used, it will be connected to the ground through a 0.01 disc capacitor. I am going to give a minute voltage into this pin. Let us see what happens. 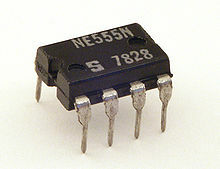 You know the working of 555 Timer and a number of circuits using the IC 555 are available. But I am experimenting with this unusual design. It will give more time delay than the usual 555 Monostable design which gives only maximum 3 minutes. See the trick. Here is a dual colour lamp to read the code printed on the Transistors and ICs. The code and number printed on the black coloured body of these components are difficult to read if the room light is low since the printing is in faint colour or as impressions. This LED lamp is useful to identify the components easily. You can switch on a load such as Water pump automatically at the required time through this Clock Controlled Relay. It uses an ordinary clock to trigger the circuit to switch on the load. The load remains on till it is switched off manually.